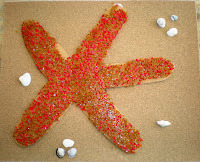 Ironically as I was checking some of the blogs I visit regularly, I found another great starfish activity. 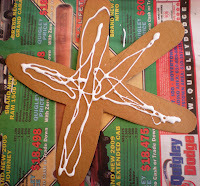 Over at Casa Camancho they made some great starfish with Q-tips. Also, last year at the aquarium in North Carolina they were very strong in stressing the point that starfish are now called sea stars. I understand their point, but it's hard to make an "old dog learn new tricks." 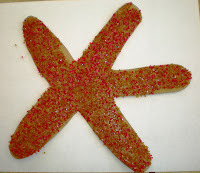 I used a side of a cereal box to make my starfish. I wanted something a little more sturdy than construction paper. My starfish is drawn freehand and cut out by me. If you have an older child, they would be able to cut this out. 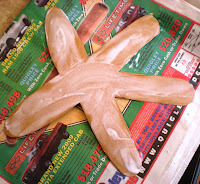 Let the children pour glue all over the starfish shape. Then spread it everywhere with their finger. A little sticky, but hey they get to play with glue. Once the starfish is covered with glue it's time to cover with the crystals. I had some "crystals" from an old Shrinky Dink set that I used years ago, remember those? 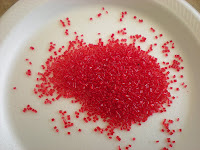 I was thinking maybe colored decorating sugar would work too. I was looking for something that would give the starfish that "scratchy" feel. 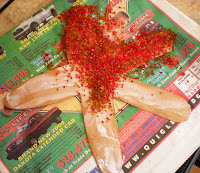 Pour the crystals all over the starfish shape then shake off the extra. 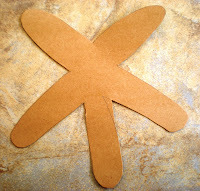 Attach the starfish to the sandpaper. I used tacky for a little extra strength. For a final little touch I added some small shells I had around the house. OH MY GOSH! Way cute! The starfish looks great, almost like the real thing. Love these! I saw Bobbi's Sea Stars too and thought they were cute. Maybe we'll make both! Totally Cute! We just did a similar craft, I love your Shrinky Dink crystals, it looks really cool! Oooh!! FUN FUN FUN! This will be great for Ollie as this is the first summer that he will really be hitting the beach! Super cute -- My girls would love this craft! !